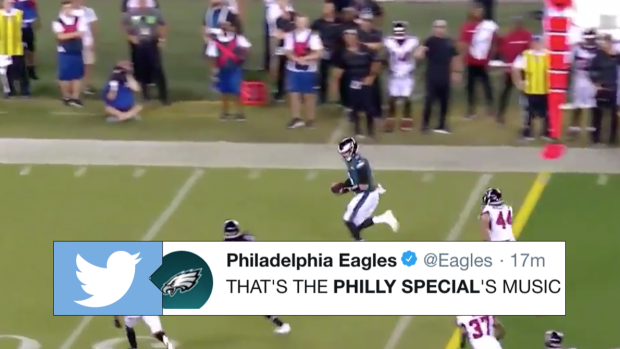 The Philly Special is the one play that stood out from Philadelphia's Super Bowl win because Nick Foles ended up catching a touchdown pass in the biggest moment of the game. It takes a lot of guts to call that play in the Super Bowl, but the Eagles executed it to perfection and it paid off in the form of a Super Bowl win. Thursday night, the Eagles opened their season against the Falcons at home and after struggling to move the ball in the first half, Philly got an offensive spark from the Philly Special - Part Two. Nick Foles just has the smoothest hands and apparently the Philly Special just can't be stopped, regardless of who is throwing it to Foles. The 3rd down conversion was huge because it led to the first touchdown of the 2018 season to give the Eagles the lead.